The cup is coming but what got us there? For the April monthly meeting, Philip Freedman offers his view of America’s Cup 34 and what it takes to compete for the sport’s oldest trophy. The meeting is at 7 pm, Tuesday, April 9, at the Caddy Shack @ Rolling Hills, 1415 North Mill Avenue, Tempe. Visitors are welcome. A meteor has hit the America’s Cup and the dinosaurs have disappeared. The oldest sports trophy has become of age. In one of the biggest sport upgrades in history, the America’s Cup has roared into the 21st century and you better use a fast shutter speed to take a shot. This summer in San Francisco Bay, the 34th America’s Cup will be defended against three countries wanting to take it out of the U.S. An estimated 600,000 will watch the competition from the banks of San Francisco Bay. 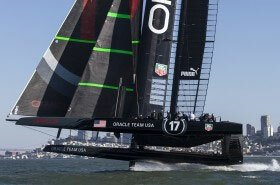 Never before has the America’s Cup been sailed in a bay rather than in the ocean where few could see. These are not just sailboats, but 72-foot-long catamarans with 13-story hard-wing masts that go twice the spend of the wind and rise out of the water onto small foils. Their crew of 11 not only wears heart monitors, life jackets and helmets, but will take physical requirements to the limits. So come spend a fun evening and hear how college, youth sailing and the twelve meters got us to where we are today. Phil warns: This will be fun. Phil Freedman is an AYC member and longtime sailor who fielded the entry Betsy Ross for the 1990 America’s Cup challenge.